XULAND: World’s First FLEX 4 Based Social Networking Application? I came up with the idea for Xuland a year ago. At the time I simply wanted to come up with a project that would allow me to dive into the Flex 4 Beta and try out some new frameworks (other than Cairngorm). I chose Swiz for its “brutal simplicity” and I was immediately impressed. I present this first to the greater Flex community as I’m really interested in feedback at this stage of its development. Does it make sense? Does it load fast? My biggest concern: determining whether Flash was the right platform for a site like this. Honestly, I don’t see why not. Flex is a great framework. Flash is a great multimedia platform. Add a little social networking features and you could have the makings of something great. I wasn’t able to attend MAX this year although I did enter Xuland into the 2010 MAX Awards. There were several other amazing sites that Adobe chose over Xuland and I don’t blame them. There truly is some fantastic talent out there and I feel blessed to even be remotely part of this group. To put it simply, Xuland is a social network centered on location, rather than a friend’s list. It started off as a way to get to know your neighbors…the people that are most likely *not* on your friend’s list. I’ve always thought Facebook was a great way to re-connect with old friends and family (not “old family”, sorry Mom) but you wouldn’t necessarily meet new people on Facebook. I remember back in the days of MySpace when random strangers would friend each other…some folks had thousands of “friends”. It was always so bizarre to me. I’m not sure if that same trend has crossed over into Facebook since its advent of fan-pages but still sites like these didn’t feel like the appropriate place to establish new friends. A better opportunity arose through Yelp. Yelp centers itself on geography. You can see reviews of the restaurant down the street which is fantastic but it was difficult to carry on a conversation with past reviewers. Sure there’s message boards, but it would be nice to carry on a real-time conversation with someone in your same town that you did not already have a past relationship with (i.e. “on your friend’s list”). Xuland eventually morphed into a FLASH-ier alternative to Craigslist, complete with a commenting & rating engine, Google map that pools postings into the comment stream based on location and selected radius, a built-in ad & local event submittal system and there’s even a simple image editor. No, this isn’t your father’s Craigslist. I’m going to add a lot more, including extending the project to include mobile. What I’ve done so far took a lot of work (spare time with a family, mind you) but I’m happy to keep chugging forward as long as the site finds some real use out there. What I really hope is to prove that Adobe Flash & Flex can be used for much more than dashboard and charting widgets or for unseen back-office intranet apps. I had a lot of fun exploring Flex 4′s new skinning architecture, the Swiz inversion-of-control framework, the cloud technology that I’m using to host Xuland and many other bits and pieces of knowledge I had to find to assemble this all together. I don’t think the site is ready for global public consumption quite yet. There’s a lot of little details I need to iron out but it works for the most part. I invite anyone reading to try it out and let me know what you think! The map should geolocate to your general area, but it won’t be exact. 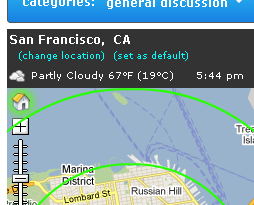 If it’s off, drag the map around and set your new default location (you’ll have to login). You can also (change) the map to anywhere else in the world which is nice. Talk to folks in Munich, or Paris. Change the map zoom, too. As the radius changes, so does the number of viewable comments. The red dot in the middle essentially shows the center of the map around which it pools comments. Login with your Facebook or other social networking accounts, or create your own Xuland account via the registration form. Try posting a comment, attach an image, or real estate posting. There are many categories similar to what you’d find on any classified ads website. You can also post a local event (I got a little tired of getting invited on Facebook to events that were in other cities!). I’ll post more on this blog and on Xuland’s own Tumblr blog. It’s getting a little difficult juggling all of this so bear with me if I seem a little slow, otherwise thanks so much for reading and trying out Xuland. With the Xuland Flex-based social networking application I’ve been working on for the past eight months, I decided to switch things up on the back-end, most notably in the services layer where I’ve been using ColdFusion 9 for my data-access objects. ColdFusion has been a perfect fit for Flex since I had used the software quite extensively for much of my programming career. However, as I prepare Xuland for go-live (August 13th – which also coincides with the Adobe MAX Awards deadline for entry date), I realized that without a license for the software I would be restricted to shared hosting services – a solution that would not work in the long-run, especially if Xuland were to suddenly gain popularity. As I considered dedicated or “cloud” hosting, I would have to either buy an $8,000 ColdFusion license (umm, no) or switch to an alternative. BlueDragon piqued my interest, but it unfortunately does not yet support AMF. Without the ability to remote, my application would launch already dead in the water. Another alternative, completely unknown to me before today, is Railo (pronounced “Rhylo” after a fictitious alien dog in Star Trek). “Railo is a free, open-source alternative for ColdFusion application development.” It currently supports the AMF3 format (whereas in the last version it only supported AMF0) and comes shipped with its own application server and servlet engine (Caucho Resin). In fact, the Express versions can be downloaded, configured for Flex and launched within minutes. The best part is it’s completely FREE. I’ve since switched from ColdFusion to Railo and with hardly any tweaking, Xuland was running against Railo executing the same CFC’s I had already written for ColdFusion 9. After starting the Railo service locally the first time, it automatically created the necessary Flex remoting-config and services-config XML files needed in the WEB-INF directory. Remoting worked perfectly, and I dare say it seems a bit faster (I have not run any benchmarks quite yet, however). If you’re looking for a solution similar to this, definitely consider Railo as it works as well as ColdFusion without the sheer cost. It’s been a couple of years since I worked with ColdFusion and Flex together, but I remember I always like the combination and chose it for my new little Xuland social networking project I’ve been working on (see previous posts). I had to remember how the whole Flex-ColdFusion remoting setup would work again and I had to overcome a couple of hurdles. I thought I’d share the experience as it would have helped me get up to speed quickly. While creating the project, select an Application server type of “ColdFusion” and check the “Use remote object access service” with the “ColdFusion Flash Remoting” option selected. On the next screen, in my case I’m using a Standalone installation and had to uncheck the “Use default location for local ColdFusion server”. Of course, the root folder was C:\ColdFusion9. I clicked Validate Configuration which validated that the root folder existed. Much of this logic may be abstracted off into controllers, delegates, commands or other framework-specific components but this is a fairly simple example of installing, configuring and executing a remote object service call from Flex to ColdFusion.